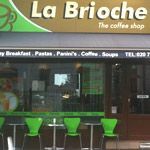 La Brioche on Old Brompton Road serves an all day breakfast alongside pasta, sandwiches and a variety of hot and cold drinks. Do you work at La Brioche? What did you think of La Brioche?